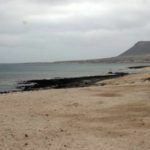 A large landscaped triangle located on the southwest coast of Lanzarote. 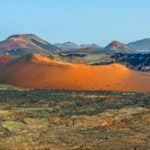 It is situated near the attractive parque nacional of Timanfaya, a perfect complement to a tourist route on the south of the island. Las Salinas of Janubio is one of the most beautiful sights of many on the island and sure to be an unforgettable one. It has an area of approximately 440,000 square metres all of which is used to produce salt with the help from its core lake that comes from the waters of the nearby coast. Dating back Salinas was originally a wasteland where products such as wheat, corn, rye and barley were grown. This however is an unsure fact as Janubio did not begin to appear as Salinas until 1895. Construction of Salinas began in the late nineteenth century. Since its creation the salt mines have been linked to fishing and salting industries as well as canned fish. They have also devoted themselves in the marketing of brine to allow for the conservation of fish on board boats until they are taken to the ports. 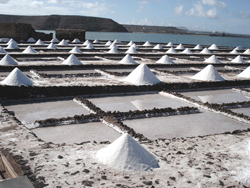 Currently its conservation is with thanks to the Lleo Padron family as they have maintained the development of the salt lakes for over 50 years. Due to the decline of fishing, cooling techniques and the competition from abroad, production has fallen by 2,000 tons and with oppose to the optimal and full production it is no longer 10,000 tons per year. Nowadays it commercializes for only the island itself, its layout is magnificent. Due to the massive explosion of colours it makes an unusual however unique architectural figure. Its surroundings contribute to an enriching postal image especially due to the contrasting mix of the salt and the black sandy beach of Janubio. By driving a few minutes from Las Salinas de Janubio you will reach Los Hervideros. The narrow flawless road designed by Cesar Manrique warns you of your approach to a unique area on the island. 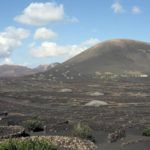 For more than two centuries since the eruption of Timanfaya, geographically the wild southeast coast of the island has been reshaped by its volcanic rock. The fast cooling of the lava upon contact with the water, combined with the erosive action of the waves, created a unique coastal landscape. The caves and the hidden morphologic coves, due to the fierceness of the sea, have generated a grand spectacular. It almost looks like a firework display as the sea breaks violently and emerges from the spillways of the volcanic coastline. Please use common sense and be aware of all road markings when travelling here especially if travelling with children (be careful as you could also get wet). This narrow and natural stoned path takes you directly to the centre of this phenomenon. Charco de los Clicos has an enigmatic figure. 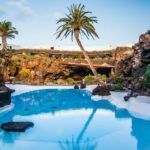 The fancy volcanic shapes give it a mystical atmosphere, capable of inspiring Pedro Almodovar in his latest film Los abrazos rotos (Broken Embraces). 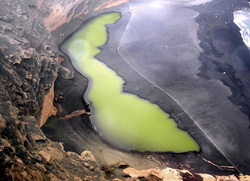 In the middle of the black sand beach you will see a green lake located in the centre of the mountains crater next to the village of El Golfo. The lake consists of emerald green filtered sea water. It has a curious coloration which is due to the build-up of algae known as la ruppia martima. Looking down from the mountain in El Golfo one can appreciate the immensity of this viewpoint however we do recommend that you make your way down to the actual beach to take a closer look. A mystique atmosphere surrounds this walk due to the many varied landforms, a huge range of colours and the constant winds breeze. 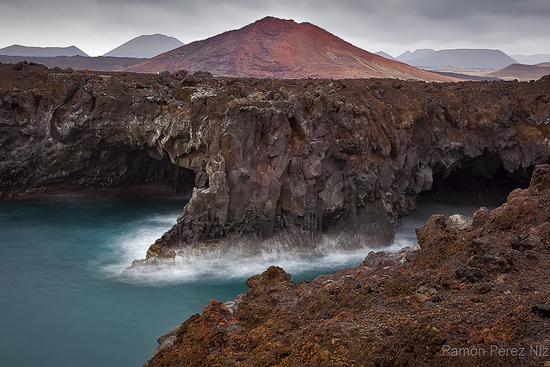 A visit to this scenic triangle, after passing through Timanfaya, should lead you onto the village of El Golfo. 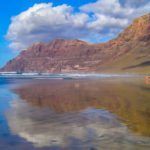 El Golfo is a sailor’s village that has become a hive of restaurants and terraces that overlook the south western rugged fringe of the island. Several dishes can be tested. We would like to recommend Casa Torano. Here you can enjoy fresh fish with canarian potatoes and canarian mojo sauce. Note: We welcome the transfer of the picture of Los Hervideros (second photo) to Ramón Perez Niz. His photos.